This event began with just a simple statement: “Let’s have a Hackathon!” Of course, nothing that starts that simple can end that way. Immediately questions began on what kind of Hackathon to have since it has become such an overloaded term, what everyone would work on, and how we would organize it. In the end, we came back to a fairly straightforward idea. Take a basic programming concept (connecting a few APIs together to create a useful project). Moreover, use it to accomplish two things at the same time! One, getting the greater programming community in Frederick to get together for a day of camaraderie and coding. Secondly to provide an event to help newer programmers learn what they need to get running quickly. So what are we really going to be doing? We decided that we needed a good public API to work with, and realized that there are a number of weather APIs out there which are relatively easy to use. On top of that, we wanted something very physical for people to use that gave immediate satisfaction when you got your code to work. Thanks to a partnership with our good friends at Nexmo we settled on the idea of sending SMS messages to your cell phone! This means that we’ll be working on creating fun little apps using weather data, and your phone. Perhaps you’ll create an app that sends you an SMS when it’s going to rain within the next 15 minutes. Maybe a Monday morning message with the forecast for the week? The details can be up to you! For experienced programmers: We will have documentation and details available on the weather API in question, as well as free credit on Nexmo’s SMS service, and a technology evangelist there who can help out with their API as needed. You’ll be able to take your time throughout the day to create whatever you want. At the end of the day we’ll have a little showcase to let people talk about and show off what they did. For newer programmers: We will have a specific program in mind, and a step-by-step walkthrough to get you started. We’ll have some senior programmers there to help you out, while we walk everyone through the paces of getting everything up and going. If everything goes well enough, you’ll be able to have your example program working by lunch, and then have the afternoon to play around with it and try out new things. Speaking of lunch. We will be providing a simple lunch (ordering in pizza) for everyone, again thanks to the team at Nexmo. Beyond that, we will see if we get other sponsors who are willing to provide other things. We’ll let you know once we do! Thanks to incredible generosity we are hosting this event on the campus of Hood College. We will be using the Coblentz Hall Seminar Room. This room should have plenty of space for us to spread out and hack away while providing us a projector for showing information to the newer programmers, wifi for everyone, space to have lunch and room for sponsors as well. 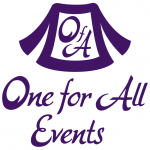 Hack Frederick is being produced by One for All Events LLC, a company dedicated to enabling technology-focused events.